The track of green turtle female “MRC rentals” (after her sponsor) updated 10 october 2015. 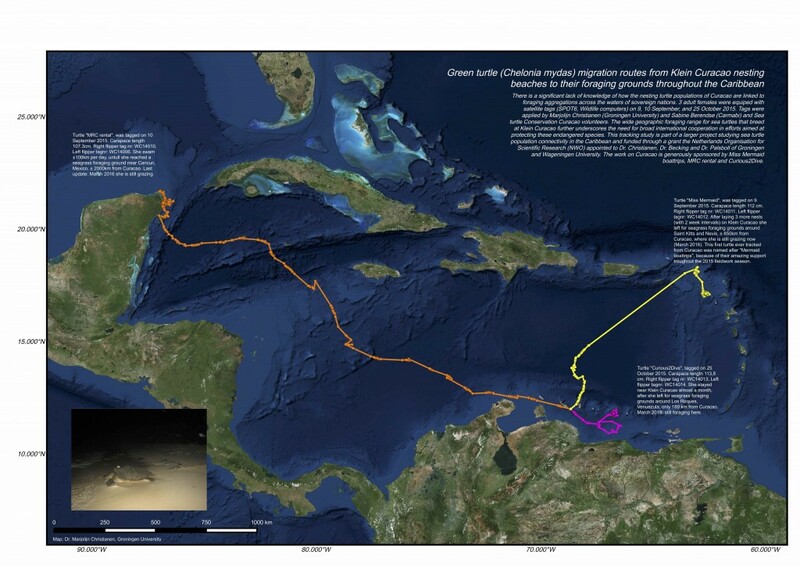 After nesting in Klein Curacao she swam 3100km in 30 days – and has now settled in Mexico, the foraging grounds in Chakmukchuuk or Laguna Manati. 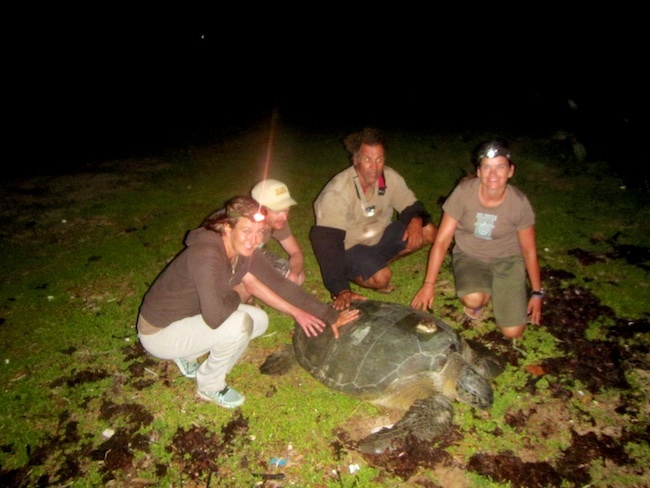 Last week we* successfully placed a satellite transmitter on a big green turtle female after she nested at Little Curacao’s turtle beach. 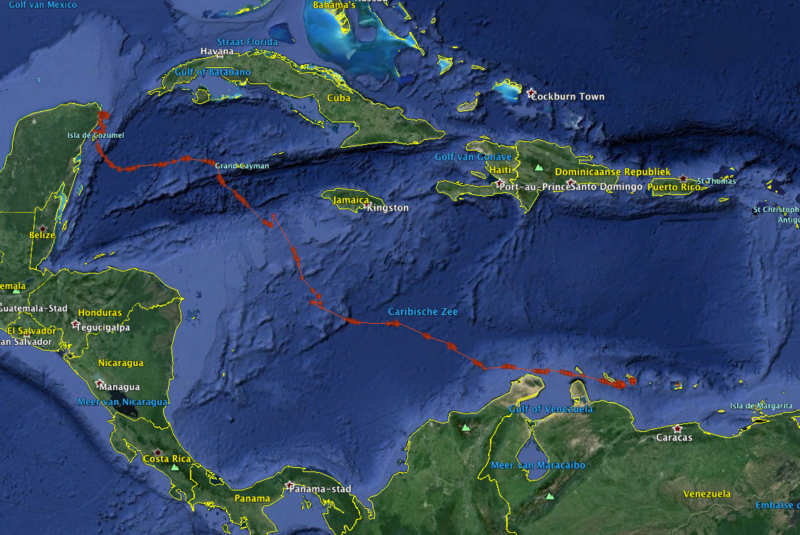 The signals of the ARGOS satellite are updated hourly and I am very happy to report that this female is swimming very fast in the direction of Nicaragua 1050km in the first 10 days. The first 2 days it first seemed she stayed around for another nest but then she decided to go for a long swim. 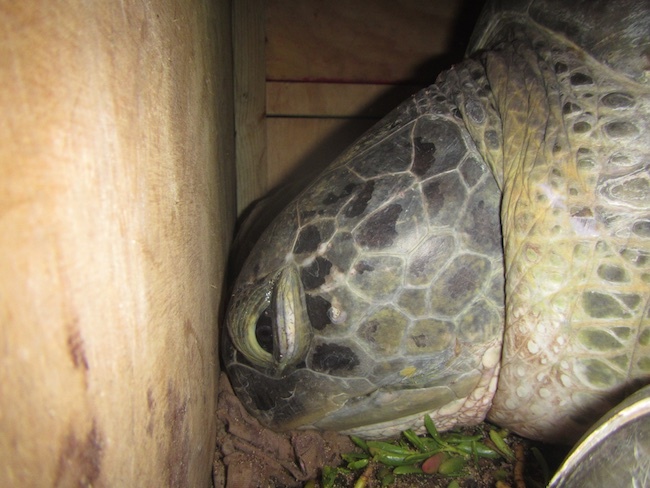 UPDATE: this female has found her foraging ground and is now settled at Chakmukchuuk or Laguna Manati in Mexico after swimming 3100 km in 3 weeks. 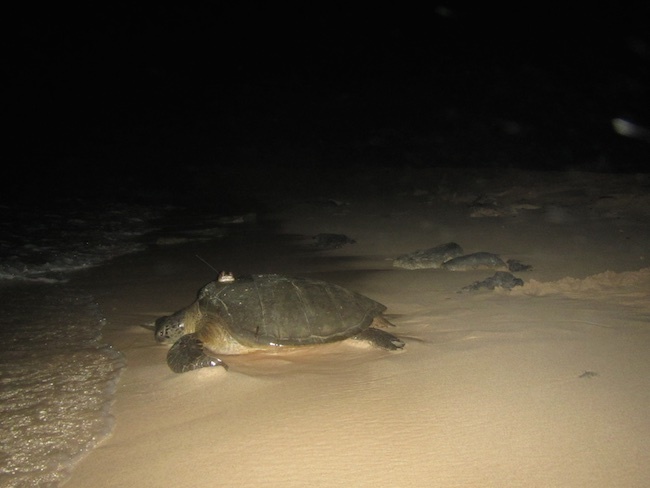 Together with the other turtles that we deployed with transmitters we hope to learn more about population connectivity of sea turtles that nest and forage in the Kingdom of the Netherlands. Below some more photo’s of green turtle named “MRC rentals” during the transmitter deployment process. This lady was quite precise in choosing her nesting spot: She first took 5 hours to go on and off (4 times!) the beach to crawl around to check out nestings spots. 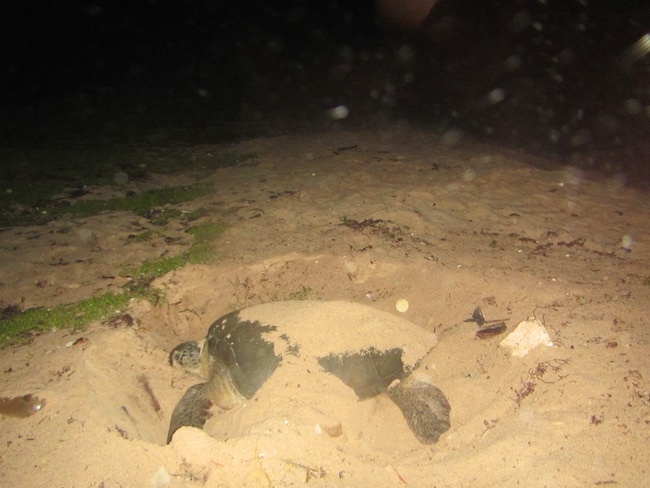 Finally – around midnight – she chose part of the beach that was already cleared from plastic and washed up coral fans by Sea Turtle Conservation Curacao’s beach keepers and others. 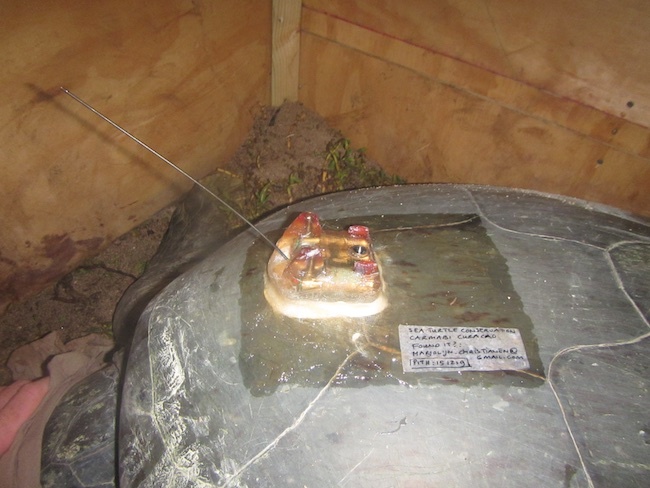 When she settled and starting to lay her eggs we put the wooden box around her and it took us 1.5 hours to fix the transmitter on her carapace with epoxy and putty. If she doesn’t rub her back too hard against coral boulders this transmitter could continue to send signals for the next year. * The team on the beach: Sabine Berendse (Carmabi, Sea Turtle Conservation Curacao), me, Jurjan van der Zee (Groningen University), Funci (sea turtle conservation Bonaire) and not on this picture; Pieter de Geus (vet involved at STCC program), Andy (staff of Mermaid boat tours). Read this facebook post for more info on the very successful cooperation with Sea Turtle Conservation Curacao. The second logger on Klein Curacao in 2 nights!